Trusa de Fixare Distributie Skoda, Fabia, VW, Polo. 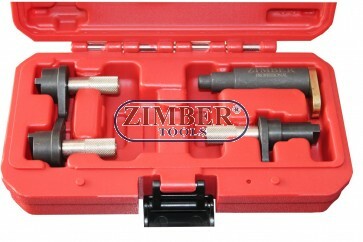 AUDI 1.2 V6 V12 3cyl - ZIMBER TOOLS. Petrol Engine Setting/Locking Kit - VAG 1.2 3Cyl (6v/12v) - Chain Drive. Camshaft and crankshaft timing tools for VAG single camshaft (6v-AWY, BMD) and twin camshaft (12v-AZQ, BME) 1.2 petrol engines in VW Eos, Fox, Polo, Seat Ibiza and Cordoba and Skoda Fabia models. 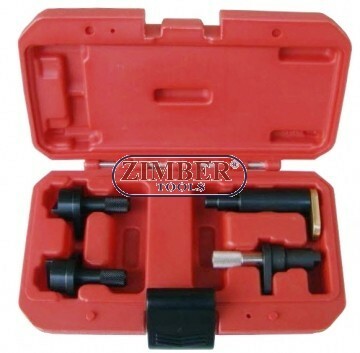 Kit contains flywheel locking pin, common to single and twin camshaft engines, and camshaft setting tool for single cams and pair of camshaft setting tools for the twin cam versions. VW GROUP 1.2 SINGLE (6V) AND TWIN CAMSHAFT (12V) 3CYLINDER PETROL ENGINES (02-) IN SEAT, LBIZA / CORDOBA, SKODA, FABIA, VW, POLO.